8mm Forum: My Elmo !ens Adapter! Author Topic: My Elmo !ens Adapter! I just made a adapter for my GS1200. And it works just fine! I can fit any small barrel lens. Right now I am using a Bolex lens like Hi Fi f1.3 and the Bolex Hi Fi F1.1 lenses. Do they look good! They have excellent edge to edge sharpness! Also they give a sharp and bright picture! I don't use my Elmo f1.1 no more! I can also use the sniender f1.1 in it! Which is better! I will be putting pictures up for you all to see!thanks to Joe Taffis for sending me a Elmo lens he did not want! An f1.3 zoom lens. All I had to do was replace the lens pin. I only had one left! I took the lens and empty it out. Took out all the inside. And I filed down the inside rear! To get the lens to fit and move just right!once I did that I gave it a good test. And to my surprise it worked out just fine! No more need to look for a Elmo f1.0 lens! This adapter is tops! Leon Norris. I've bought an adapter at van Eck for the schneider f1.1 into my Elmo GS1200 and it rocks. I can attest to the quality of those Bolex "hifi" lenses. I currently am using a Bolex zoom on my Sankyo 2000, and a Bolex prime lens, that is better, on the Elmo FP8-C. 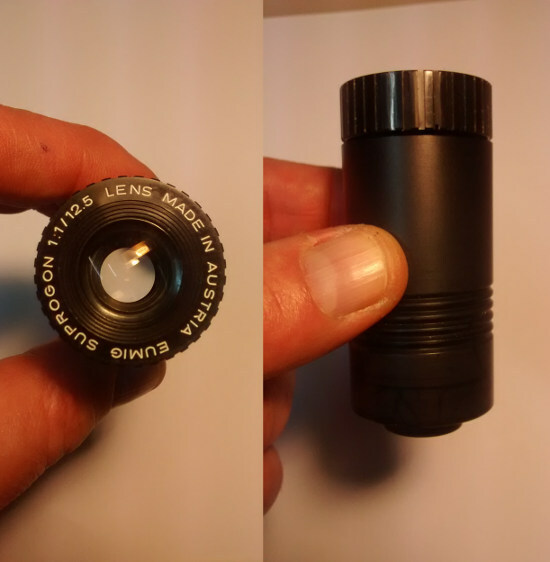 It appears others here on the forum use these lenses, but for those that have never had one your really missing out. Still my favorite for projecting, especially the prime. Are they better than the Schneider Kreuznach f1.1? Thanks Kevin. I'll check it out! A Schneider 1.1 for the ST1200HD, that would be good. Dad always used to say you'll never beat a prime lens in a projector. The schneider sleeve lens is excellent in every respect. Your Dad was correct a good prime lens can never be beat! I've tried various zoom lenses from Schneider, Elmo, etc. Every time I go back to the Bolex 1.3 prime lens. I'm not saying Bolex made the best lenses in the world, but their prime lenses are very very good. To be honest it's the only prime lens I own, the rest are zoom lenses. The prime lens not only allows more light to transmit on screen, but it also allows the grain to shimmer, and the sharpness is unbelievable. I do have to project a smaller image, but that's OK because Super 8 seems to look best within it's limitations. I totally agree that prime lenses are the best, on both cameras and projectors. I have a Kodak Ektar f1.0 22mm prime lens from an old Kodak M100 projector. I use it on all my Eumig's and the difference is amazing. Ah I see, that's what Prime stands for. Sorry I did not know the word for it. I thought that Prime stood for most special serie lens. A fixed lens without zoom. That indeed is the best, as for photography as well for projection. Maybe I need to go for a lens like that as well. I have a projectionroom that will be finished end of February. It's for my work, where I can do the ISF-calibrations on the digital videoprojectors I sell, but there we will do all the Super8 projection as well, on a fixed screen in a shadowbox enviroment. A Prime lens is suitable for a fixed setup. Is there a way to calculate which Primelens I need, to fill this screen completely? - The projectorlens is about 4.5 meters from the screen, which can be less, but not more. The screen is 16:9 but we have black lightabsorbing curtains on the left and right, so we can make it 4:3. Oh man,... the ideas and knowledge I get from this forum is amazing. I hope this helps. Suitable for S8 projection. Like Matthieu, I didn't know that "prime Lens" means not zoom. That explains why the picture is equal or better than an Elmo 1.1 ou 1.0. I found this definition for a prime lens at Wikipedia. The term prime has come to mean the opposite of zoom—a fixed-focal-length, or unifocal lens. While a prime lens of a given focal length is less versatile than a zoom lens, it is often of superior optical quality, wider maximum aperture, lighter weight, and smaller size. These advantages stem from having fewer moving parts, optical elements optimized for one particular focal length, and a less complicated lens formula that creates fewer optical aberration issues. 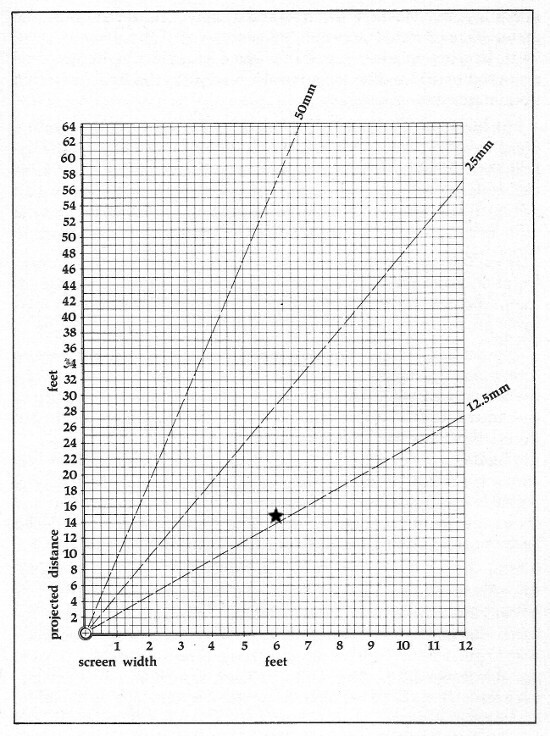 Larger maximum aperture (smaller f-number) facilitates photography in lower light, and a shallower depth of field. I have a feeling that a prime lens is the basis for a zoom lens which will have more lens elements added as a type of variable converter. The added elements have more air to glass junctions that causes lack of contrast lowering the picture quality. I think 13mm will possible work as well. Stupid of me that I did not check this myself this way, but I placed my Elmo GS 1200 in that room. Turned the zoomlens to it's widest angle at 12,5mm and the picture is 139 high. This is good, because I can place my projector a bit closer instead of all the way with the 1200" reel almost in the curtains. If I go for a 12mm Prime Lens or a 13mm Prime Lens, for what brand must I go? Or is Bolex the only one who made them for 8MM projectors? I have to make it fit for my Elmo or Beauer. Better still, if it can fit in my Beauer, I have the adapter to make it fit my Elmo as well. Prime lenses were the norm on Standard 8mm cameras and projectors prior to the early 1960's. This is the main reason, along with the inherent superiority of double 8mm roll film going through an all metal gate, that 8mm Kodachrome film from this period looks so stunning. Super 8 of course has about a 40% larger frame, but the ubiquitous zoom lenses on super 8mm cameras and projectors, along with the nasty plastic super 8mm camera cartridge, compromises what can be achieved. DS8 film, run through a Bolex or Pathe DS8 camera fitted with prime lenses must be something to see. Hmmm, so I need to search for a Standard 8mm projector or pathe projector than. Those projectors can sometimes be bought very cheap. I go searching for one. Even a 10mm lens or less can be very handy for filling up my buildin electrical screen in my living room. Not necessarily, I have an Elmo FP8-C Dual 8 projector from the 60's that is fitted with a Bolex "hifi" prime lens. Get yourself one of these projectors, and a Bolex prime lens from the first 18-5 series machines. The lens will fit without any modifications. The 18-5 Super has a larger diameter lens so these will not work. The FP8-C I own has the EJM halogen 150 watt bulb. Here's a link to my YouTube video of the Elmo I own. Please excuse all the rambling in the video ha. Hi Shane, it's a small world! I used to live in Montoursville working at Litton Electron Devices (now E3) on Westminster Drive in Faxon. Many happy memories of working there, among them it was where I first met my beautiful wife. They don't call that area 'Gods Country' for nothing. Glorious scenery, great trout fishing, and wonderful people. I still miss it. We get to WMPT every few years, maybe next time we could get together for a cup of coffee and chat about film collecting. The only prime lens I found of such a focal length is a very good lens: the "Eumig Suprogon 1:1 / 12,5mm". A nice list of projectors and lenses to search for. Are there any 10mm or 9mm lenses around? I did found a lot of lenses with fish eye in the title. Not exactly what we are talking about. My favourite lenses to use on Elmos are the F1.0 zoom and F1.2 25mm to 50mm zoom with their all metal barrels and real glass (not plastic) optics. Once stripped and cleaned the on screen results are sharp edge to edge with far better contrast than any other lens (prime or otherwise) I've tried, and trust me I have tried many, many types in my time although never one of the prime Kodak ones Paul uses which I would love to see in action. Anyone who has attended the shows at the BFCC by Keith Wilton & John Clancy often mention the amazing quality of their 25 feet wide Super 8 images - the lens they use is an Elmo F1.2 25mm to 50mm zoom too. The key thing to remember here is the Elmo zooms do deteriorate over the years and suffer greatly from internal dust and surface dirt / moisture / mild fungus. They are effectively open to the elements because of their moving parts whereas a similar age prime lens is totally sealed, hence the complete strip down and clean up of an Elmo zoom is needed before fair side by side comparisons can be made. They are also a far better match for Xenon & HID use as the Elmo lenses produce a warmer image than Schneider's which accentuate blue. The Schneider F1.1 when used in my Elmo GS1200 Xenon & HID was, to my eyes, far too 'cold' image wise - the Schneider works great with a warmer toned halogen lamp projector though. I`ve noticed sometimes the xenovaron 1.1 can overcook some B+W images. The 1.3 12mm one is very good though for B+W.